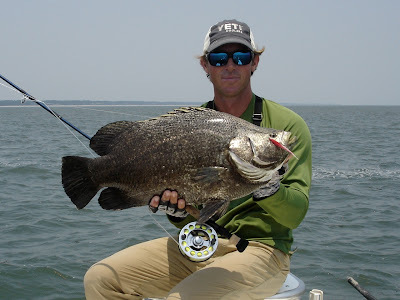 Captain Brain Vaughn of Off The Hook Charters was fishing on July 10th and spotted a free-floating tripletail or 3T underneath a floating horseshoe crab. Picking up his fly rod and casting a Lefty's deciever with a 20-pound tippet attached, he brought in a fish that landed him a record with the hallowed International Game Fish Association. To view past blog entries on state record fish click here.